Hey all you people who just finished marching this summer! We're running out of Forzato pics! Hurry up and e-mail your best shots from the summer to dave@dci.org along with where and when the photo was taken. Send some biographical information about yourself as well. We'll give you full credit. Also, let us know if you want your e-mail address included. Bill Sakalaucks sent in this one. "This is a picture of a couple friends and I at Drums Along the Chippewa 2005. 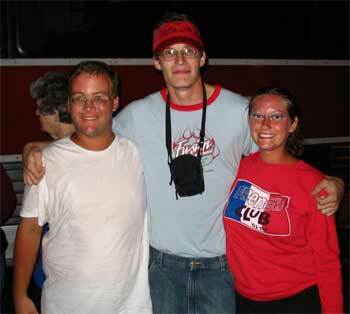 Alex Larson (left), me and Rachael Waggoner (right) all met initially online in a drum corps forum. They marched this year in the Blue Stars and I was a bleacher creature." Thanks Bill!